It's not just that the food was good, but also the importance of it. My days seemed to revolve around food. It's part of the culture, the overall identity. Not since my freshman year of college has so much of my time been devoted to eating. During the homestays, the families would bring out bowls and bowls of food containing various curries, fish, vegetables, and fruits. Definitely discovered some new favorite foods along the way, such as the Thai omelet. Now a Thai omelet isn't a traditional omelet, or one that you and I would imagine. For one thing,you can have a Thai omelet any time during the day. Usually it's more of a lunch or dinner food. Also, a Thai omelet doesn't have an excessive amount of things in it. Actually, it's just the egg...and usually some bits of meat inside, such as chicken. Chicken, egg. Nothing complicated, rather stupid simple. But it's absolutely amazing. Put some chili paste over that thing along with some rice, and it's complete heaven. That's another thing about Thai culture that will probably be a running theme in this post -- everything's simple. The ingredients in the dishes are kept to the bare minimum, it seems. For most meals at the homestay, the foods were collected from the garden or freshly caught at the sea. -Because of this innate ability for a Thai person to cook up a fantastic meal with only a handful of ingredients, if a Thai were to ever be a contestant on Hell's Kitchen, I'd put it at 2:1 odds that he or she would win if they aren't required to know a handful of Eureopean dishes. Those challenges where the cooks have to make a meal by only using ingredients they find in a half-stocked fridge would be no contest. -You eat with a spoon and fork by using the fork to help scoop food onto the spoon. Kinda takes a meal or two to get used to, but it's a highly efficient way of eating. Very easy to clean up your plate, because you can destroy every grain of rice with the spoon-dominated method. -Mangosteen is quickly climbing my favorite fruits pyramid. It looks like something that Link from Zelda would eat. Purple ball with a cartoon-ish green leaves at the top. Open it and there's white flesh. Really good. My absolute favorite dessert. Sticky rice balls in coconut milk. I need to figure out this recipe. Ok, I need to stop thinking about this or else I'm going to pass out. Try doing this in LA, and people will think you're crazy. 4. Not having to follow the LeBron James fiasco. With limited internet access and no TV, I'm glad that I didn't have to be bombarded with LeBron James news or "The Decision." Have you visited Ban Talae Nok village as part of an Andaman Discoveries tour? Andaman Discoveries and the villagers alike proudly announce that Ban Talae Nok is now on TripAdvisor, where three people have already given the picturesque village top ! We encourage you to visit the TripAdvisor site, read the reviews, and provide your own feedback. TripAdvisor.com is a free travelguide and research website that assists customers in gathering travel information, posting opinions of travel related issues and engaging in interactive travel forums. TripAdvisor is an example of consumer generated media. The website services are free to users, who provide most of the content, and the website is supported by an advertising business model. Jenny, known as the Jeneral during her time in Kuraburi, spent over 5 months working with the AD team. Her spirit of adventure, hard work, and boundless enthusiasm were appreciated by all who crossed her path in Kuraburi. Jenny focused on program development and marketing, helping us reach new guests and communities. Her filed work included visits to Ban Talae Nok, piloting homestays in Ban Lion, and creating a new hiking route in Nai Tui. We hope to see her back soon, Kuraburi is missing her. 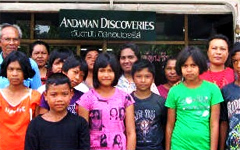 Mimi joined the Andaman Discoveries family in 2008 with a mission to take its success to the next level. Shortly after Mimi finished her Master's degree, she heard about our post-tsunami projects, and joined Andaman Discoveries to put her knowledge and skills to use. During more than 2 years in Kuraburi, Mimi was a pillar of the organization - she developed new village tours, oversaw financial planning, and steered the organization towards self-sufficiency. Love called, however, and Mimi left Andaman Discoveries to marry her sweetheart, Phillip. THANK YOU MIMI, for all of your dedication, support, and friendship. Mimi’s academic background includes economics, finance and management studies. She has worked in the investment and pension industry for a number of years before calling it quits. Soon after, she volunteered in a turtle conservation program in Costa Rica, and then went on a solo three-month journey to Asia, including Thailand, of course! Her next adventure was back in her hometown in Toronto, Canada, where she headed back to the books to get a degree in Master in Environmental Studies, with a focus on community-based tourism. She spent two months conducting research in Northern Thailand. Hello there, my name is Nan and I have been working for Andaman Discoveries for just over one year now. I got the opportunity to come to Kuraburi after working for a large organization in Bangkok. I thought I would only be here for a few months, but after learning about Andaman Discoveries' work and spending time with the staff and villagers, I found the idea of leaving very difficult. Recently, we met with each one of the 129 students in our scholarship program for a yearly check-in. “The scholarship helps me achieve my dreams, because with an education, I will have a way to make them come true” said scholarship recipient Chanthip Sunsab of Tung Dap (pictured). Andaman Discoveries scholarships provide financial support for underprivileged children in the region like Chanthip, allowing them to complete high school. The scholarship helps offset expenses like school uniforms, transportation to school, extra books, and extra tuition for classes like computer studies. If you’re interested in sponsoring the education of a student in the North Andaman region, please contact Andaman Discoveries to learn how you can become a donor, and read the full article for more details about scholarships and the recent round of interviews. Because of the positive impact of this program, we hope to offer to up to ten more scholarships focused on conservation and sustainability this year. But we need your help in sponsoring more youth. “There is further need for new donors to support youth in our communities. Each year children start school with need for uniforms, transport and supplies to ensure their education is a success,” said Thamrong Chomphusri, Andaman Discoveries Director. The price of making a tremendous difference in a youth’s life is about 6,000 baht (about $170) per student for a one-year scholarship (grade K -9). A one-year scholarship for one student in grades 10-12 is 15,000 baht (about $425). Donors of scholarships receive regular updates, including grade reports and details from the interview. A requirement of the scholarship program is that students must come for follow-up interviews and progress reports. Interviews are held annually with scholarship recipients to monitor their progress and discuss their goals for the upcoming year. Students also make a card with a message to their donor. Interviews include questions about their favorite subject, their goals for the next five years, and how they plan to achieve those goals. A few weeks ago, I had the chance to go to Ban Talae Nok, a close by village with who Andaman Discoveries does Homestays. I was staying over night with a very friendly family and again felt sorry that my Thai is not yet good enough for any type of proper conversation.. But we still were able to communicate - no language was needed to see how much I enjoyed the food and their hospitality. Also, P'Tui, AD's director was never far away to translate, staying with Janice and Andrew, the volunteers who spent the whole week there. Also, we had the chance to jump into the ocean at the beach nearby which was wonderful after getting all dirty in the muddy jungle where we got the mangroves and palm plants for reforestation. What a great experience to get to know life in a small authentic village while helping the locals! For the weekend, we went to the closeby Khao Sok National park in the jungle where we did rivertubing and relaxed in a beautiful resort surrounded by rainforest and its animals! Amazing. If you want to know more about my time in Kuraburi, working as an Intern in the office of Andaman Discoveries, check out my personal Blog: http://u-did-snider.blogspot.com/.